Alison Shaffer: ‘Angels Sing – Libera in America’ will be on WHYY this Sunday. Get a sneak peak! 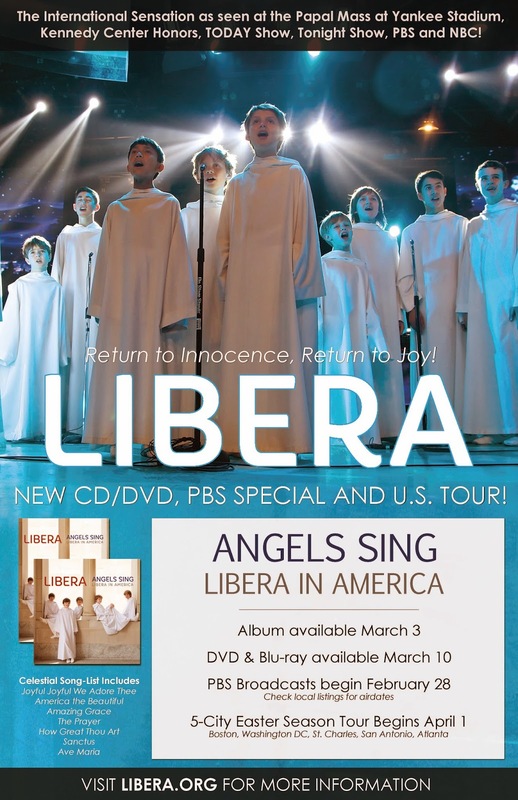 ‘Angels Sing – Libera in America’ will be on WHYY this Sunday. Get a sneak peak! Tune into WHYY-PBS (Philadelphia area) this Sunday, March 1, for a concert 6:00 AM and 11:00 PM. Watch and hear a PBS special and upcoming CD/DVD of the popular boys choir. Titled ‘Angels Sing – Libera in America’, the special will show Libera in concert at the Catholic Basilica of the National Shrine of the Immaculate Conception in DC. The concert features a selection of sacred and secular songs arranged in Libera’s trademark style, along with a great lighting display. Visit Libera.org for more info.